Svaroopa® Yoga is a technique for opening your body (roopa) to find your Self (sva). It has a radically different approach than most modern styles of yoga and can give you a new way to think about asana practice. The practice creates a core opening by releasing the tensions in the deepest layers of your body. Dissolving these tensions allows you to live with ease, both in your body and in your deeper self. That ease is your birthright. This all happens without sweat or strain because Svaroopa Yoga is not exercise but a scientific maximization of the body’s natural capacities. When practicing Svaroopa Yoga, we delve into our body as if opening a precious gift carefully wrapped in many layers. Svaroopa® Yoga is a technique for opening your body (roopa) to find your Self (sva). This powerfully transformative practice can be experienced with just four asanas, called the Magic Four. They’re simple and amazingly effective. They begin by releasing the muscles connected to your tailbone—the pivot point of your body. With enough release in your tailbone, your whole body will realign from the inside outward. The changes will automatically extend down your legs through your hips, knees, ankles, and feet. Simultaneously, a domino effect of release will climb your spine through your sacrum, waist area (lumbar vertebrae), rib cage, shoulders, neck, and skull. This spinal release opens more space for the intervertebral discs and delicate nerve roots that coordinate every muscle, bone, artery, organ, and gland in your body. This opening also lifts mechanical compression off the internal organs, improving their functioning immediately. With less tension throughout the body, your vital systems find their natural balance. Your breathing also opens up easily and immediately with the first pose. The Magic Four will enhance your vitality and physical stamina while improving your state of mind and helping your emotions to rest in joy and compassion. The most important aspect of working with your body in Svaroopa Yoga is discovering the deeper dimensions of your being. This is the culmination of yoga’s promise: you truly are more than you think you are. The inner spaciousness opened by the Magic Four is a genuine physical reality, but it is more than that. In the full sequence of Svaroopa Yoga, the inner opening goes much deeper as your life energy (prana) starts moving through the central channel of your spine unimpeded. The poses prepare your physical and subtle body for the more powerful opening that yoga promises. You gradually learn to surrender into a grace that is ever-present, though the tendency is to hold yourself tight and resist that flow. The outer practice of these asanas leads you to recognize that the source of grace is deep within your own being. The inner spaciousness opened by the Magic Four is a genuine physical reality, but it is more than that. The Magic Four can be done in as little as 20 minutes or can be extended to a full hour to facilitate deeper opening. These four poses include all five directions of movement (forward bend, backward bend, side bend, inversion, and twist), are suitable for all ages, and are accessible to everyone from newcomers to experienced practitioners. Careful attention to alignment and simple props (a firm chair and two yoga blocks) are used to pinpoint and gently release the tensions deep within your body. Stage 1: Tip your torso forward, elbows on your knees, with your hands hanging softly between your knees. Let your head hang forward so the back of your neck lengthens. Soften through your shoulders so the vertebrae between your shoulder blades soften and sink inward gently. Stay in Stage 1 for a minimum of 45 seconds or up to 3 minutes, breathing easily. You might feel a softening or tingling in the base of your pelvis as the tension in the seven coccygeus muscles begins to unravel. Or you may feel nothing. Those layers of muscle have been tight for a long time and may be completely numb. This pose engenders a deep opening whether you can feel it or not. This vertical alignment of the shins is one of the hardest things for new students to find, and hard to see from the angle your head is at, so you may want to do this in front of a mirror. Make sure your toes are turned inward. Remain in Stage 1 if you have high blood pressure (even if it is controlled by medication), hiatal hernia, glaucoma, or a history of detached retina, or if Stage 2 is uncomfortable for any reason. 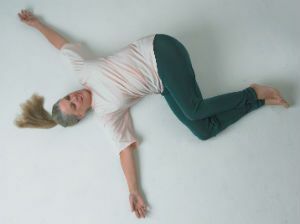 Stage 2: Slide your arms down in the space between your knees and allow your torso to sink slowly forward. Your back will round as you let your head and arms hang. Your arms may end up pushing your knees wider, but keep your big toes firmly on the floor with your toes still turned inward. Stay in Stage 2 for a minimum of 45 seconds or up to 3 minutes. Continue with easy breathing. Bring your legs and feet together. Slide your feet forward 1–2 inches. Place your left ankle on your right knee and pause there for a breath or two. Keeping your anklebone on your thighbone, slide your ankle toward your hip. If you allow your ankle to slip down onto your inner thigh or to hang out over the edge of your thigh, you’ll miss out on the benefits of the pose. Keep your anklebone on your thigh bone. If this ankle placement causes uncomfortable pressure on your thigh, you can pad it with a folded sock. Stage 1: Lean into the back of the chair. Keep your shoulders softly back, while you lower your chin toward your chest. Soften into the pose and remain for at least 45 seconds or up to 3 minutes. These angles reach through your hip joint to release the sacrum muscles, especially the piriformis. You may feel this release as an internal movement behind your intestines because this muscle is connected to the front face of your sacrum. If you feel it in the outside of your hip or thigh, it is still working. If you feel a pulling sensation in your crook’t knee, place a thin pillow under that thigh. This will release tension in your spinal muscles, which will take the pressure off your knee. If you needed to stay in Stage 1 in the previous pose, or if you had difficulty getting your legs into this position, do not go into Stage 2. Stage 2: Inhale as you lift your lowest front ribs upward, and exhale as you lead with those ribs to move your chest forward. Allow your back to round and your head and arms to hang. Your arms can hang in front of your legs or out along the sides. If you feel a pull in your left knee, return to Stage 1. If your right knee drifts out toward the right, use your left hand to pull it back into line with your hip and foot. Precise alignment will help you get a release in the tight places in your spine. Soften into the pose and continue with easy breathing for 1–2 minutes. Kneel on the floor with your hands on yoga blocks. Move your left foot forward through the space between your hands, placing it ahead of your hands so that your left leg is almost straight. If you find you are lifting your hands (even a little) in order to do this, make the blocks under your hands taller. Lean solidly into your right hand with your palm flat on the block. Place your left hand on the left side of your belly, below your waist, and push your fingers slowly and deeply into your belly, toward your spine. Use your hand to move your belly and spine sideways onto your thigh. Now slide your left hand upward to your lowest ribs, and use your hand to move these ribs forward toward your knee. This lengthens and aligns your spine. Place both hands on the floor (continue to use the blocks only if needed). Lower your head alongside your front knee. Your hand must be solidly placed on your palm or fist. With your palm flat, you will get the release in your spine that is intended in this pose. Leave your back knee in place on the floor as you move slowly forward, as far as possible without pushing or straining. Reposition your left foot by sliding it forward or back in order to get your heel directly under your knee, so your shinbone is vertical. Your belly must stay on (or directly above) your thigh—if it slips off, back out and begin again. You can feel the lengthening of your back leg, especially in the front of your thigh, and that lengthening provides traction to your spine through the waist area. While you may also be aware of tension in your front leg, it is the back leg that provides the most reliable access to your spine. Distribute your weight evenly on both hands (palms or fists). Allow your head to hang and tuck your chin in a little. Continue with easy breathing and remain in this pose for at least 45 seconds or up to 3 minutes. Lying on your back, bring both knees toward your chest. Your knees are touching. Use your hands to hold your knees and let your legs relax. Rest here for a few preparatory breaths. Extend your arms out to your sides along the floor, with your palms facing up. Roll your legs and hips to your right and lay your bent legs and feet on the floor. Allow your left shoulder blade to come up off the floor if needed, so you can get your right leg and foot fully on the floor. If your top knee does not land on your lower knee, place a small pillow in the space between them. Slide your legs toward your right arm and move your arm toward your legs until the kneecap of your right leg touches your right wristbone. This will decompress your spine through your waist and farther down. Slide your left arm down into a similar angle, so your arms form an A-frame with your palms facing the ceiling. If your left elbow does not reach the floor, bend your elbow and lay your palm on the side of your waist, while allowing your elbow and shoulder to lean toward the floor. Move your feet outward to get a 90-degree angle at your knees, and rest your top foot on your lower foot. Turn your neck and head toward your knees for a lengthening through the left side of your neck and into your jaw, as well as through the front of your left shoulder and across your collarbone. This neck-and-head position concentrates the twist in the vertebrae behind your heart, which need extra help in getting the deep release. 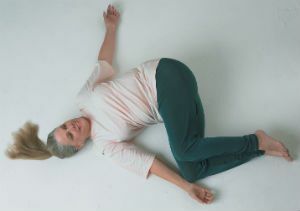 Allow your whole body to soften while you rest in this pose and stay here for a minimum of 45 seconds or up to 5 minutes. When you are ready to get moving, rest on your side for a few breaths so you can take the inner openness with you. This is called vyutthana, savoring the inner experience and allowing it to permeate your mind as you expand your awareness into the external world again. You do not have to lose the inner openness and depth that your practice has provided as you move into the world. Instead, allow your awareness to expand from the inside outward, to base yourself in the deeper inner essence that yoga calls Self, while you engage with the world in a state of openness and ease.